Knees - Toms River, NJ: The Center for Orthopedics and Sports Medicine, P.A. The knee is one of the most important joints of our body. It plays an essential role in movement related to carrying the body weight in horizontal (running and walking) and vertical (jumps) directions. The knee is a hinge type joint that connects the thighbone (femur) and the shinbone (tibia). Ligaments (lateral collateral, medial collateral, anterior cruciate and posterior cruciate) are tissues that connect the two bones and allow the knee to bend, straighten and rotate. Articular cartilage covers the ends of the bones and under the kneecap (patella) to assist in movement. The meniscus is a cushion of cartilage between the leg bones which helps to absorb shock. Non-contact tears and ruptures are the most common causes of ACL injury. 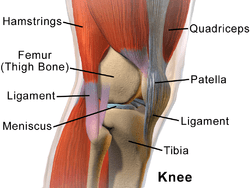 Injuries of the ACL range from mild such as small tears to severe when the ligament is completely torn. Tears in the ACL often take place when the knee receives a direct impact at the knee while the leg is in a stable position, for example, a standing football player is tackled sideways when his feet are firmly planted. A torn ACL can make the knee unstable. 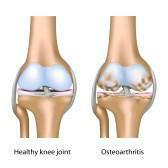 Constant use of the knee over time can cause arthritis. The is when the articular cartilage wears away and roughens. Bone or cartilage fragments can also break off inside the joint. Either problem can limit movement and cause pain. Arthroscopy is a minimally invasive technique used by orthopedic surgeons to treat sports injuries such as ligament and cartilage tears. The procedure is performed using an arthroscope that is inserted into the joint through a small incision. The advantage of arthroscopy over traditional open surgery is that the joint does not have to be opened up fully. Instead, for knee arthroscopy, for example, only two small incisions are made - one for the arthroscope and one for the surgical instruments to be used in the knee cavity. This reduces recovery time and may increase the rate of surgical success due to less trauma to the knee. There are several methods that are available to address cartilage damage. The aim of any articular cartilage repair treatment is to restore the surface of a joint's cartilage. Articular cartilage repair treatments help patients to return to their original lifestyle; regaining mobility, going back to work and even practicing sports again. A meniscus transplant consists of taking out a worn or damaged meniscus and replacing it with a new one from a donor. Partial knee replacement is a surgery that may be considered for treatment of severe arthritis of the knee. Partial knee replacement allows an orthopedic surgeon to remove only the damaged portion of the knee, leaving the healthy knee intact. Because less of the knee must be removed, the incision size is smaller, and less tampering with the muscles and tendons occurs. This provides the patient with benefits such as reduced scarring and reduced post-operative recovery time. Most often, partial knee replacements use implants placed between the end of the thigh bone and the top of the shin bone. 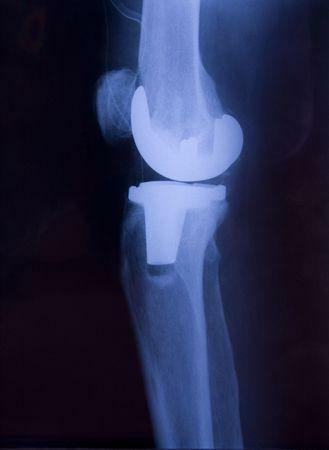 Partial knee replacements can also replace the part of the joint under the kneecap. Partial knee resurfacing is a surgical procedure for helping to relieve arthritis in one compartment of the knee. Only the damaged surface of the knee joint is replaced, helping to minimize trauma to healthy bone and tissue. 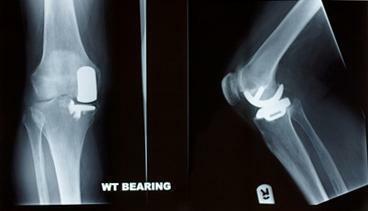 The surgeon removes only damaged bone in the affected knee and fits the implant to that bone. Minimally invasive knee replacement surgery involves the removal and replacement of an affected knee joint through a smaller incision than traditional total open knee replacement surgery. The surgeon replaces the diseased or damaged knee joint with a prosthetic joint, made to mimic the function of a natural knee. Prosthetics have been engineered to feel as natural as possible, and are made with only biocompatible materials to ensure comfort and support. Using current techniques, 90% to 95% of minimally invasive knee replacement surgeries last more than 15 years.